Hello there! My name is Bartek and this is my personal blog. I write mostly about native coding in C++. I use C++ on a daily basis, so that’s why it dominates my blog posts. 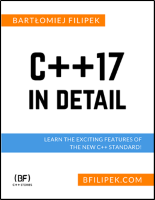 See my Book about C++17! At the end of the year I write about C++ status. It’s my summary of events that happened in a particular year, compiler support of modern features, the standard updates, new features. Learning Modern OpenGL @Codeproject - one of my best articles, that landed on external site instead of this blog.